Providing you with excellent protection against cutting threats, the Polyco Blade Runner Solo Cut Resistant Gloves are ideal for a number of different industries. With level 5 cut resistance (the highest level attainable under current EU testing), Blade Runner Solo Gloves offer serious protection for your hands. The Polyco Blade Runner Solo Gloves have been tested in accordance with EN 388, the European standard that governs the physical resistance of gloves. Please see the table below for a breakdown of results. The Blade Runner Solo Gloves are available only in size 10, which is roughly equivalent to an extra large. To discover whether or not this size is suitable for you, measure across your palm at the base of your fingers; if the measurement is approximately 9 - 11cm, the gloves should be suited to your use. 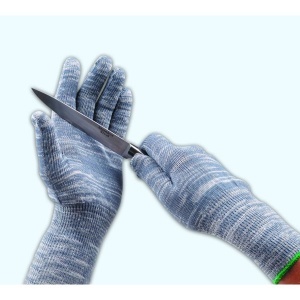 In order to get the most from your gloves, please ensure that you remove and contaminants or dirt after use. The gloves should be stored away from direct sunlight in cool and dry conditions.